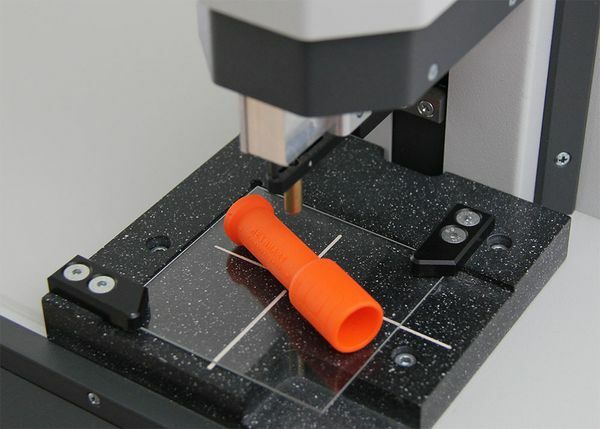 „Shore A nano“, due to its unrivaled nano-test technology, enables a measurement in the entire range of the Shore-A-durometer on rubber or elastomer products. The method is based on the miniaturization of the measuring needle as defined in the standards. Because of its innovative surface identification, all measurements are independent of the specimen’s geometry. Without problems even measuring very small specimens or granulates is therefore possible. Compared to standard measurements this measuring method does neither need a plane measuring surface nor a significantly smaller measuring needle penetration depth. To make comparative measurements 0.05mm (50µ) are already sufficient. Measurements, carried out with “Shore A nano” yield identical results compared to standard measurements after DIN ISO 7619 (replaced by DIN 53505), DIN EN ISO 868, ASTM D 2240 or JIS K 6253-3. In order to fix the measuring position accurately, “Shore A nano” provides an optical crosshair.